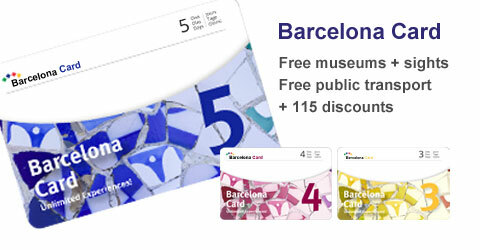 The Barcelona Card is the ultimate City Card: save money and time with free usage of public transport, free admission, lots of discounts and admission without standing in line. If you would like to get to know Barcelona on your own, the Barcelona Card is ideal. Enjoy your stay in Barcelona with your Barcelona Card! Delivery via e-mail (voucher) and via mail. Free and unlimited use of public transport: TMB buses, Metro, Urban trains of FGC, Tram, Trains of Renfe Rodalies in zone 1. Free bus 46 and train to / from airport. For more than 75 other attractions such as sights, shops, restaurants and more you receive discounts up to 50%. Here you can download the complete list of included services (pdf-file). Book here your Barcelonas Card (adult) with a discount on the regular price. Simply enter the number of Cards you would like and select the shipping method. You have the choice between mailing and e-mailing (voucher). You get the dicounts directly at the box offices. When admission without staying in the queuing you can go inside directly. If you need less than 10 Barcelona Cards you can book them on our booking page. We have special prices for children (4-12 years). Full flexibility: you can decide by yourself when you want to use the Barcelona Card in the year of validity. Our vouchers are valid for one full calendar year for a single use. Start of validity is the first use of the card. The Barcelona Card is valid from the first use for 72, 96 or 120 hours. The same for the ticket for public transport which is included in the Barcelona Card. The validation of the Barcelona Card 2017 is also continuing beyond the turn of the year, if the first-time use was still in the old year. The 2018-Barcelona can be used from 1.1.2018. Shipping by post (€4.90): In order to receive your Barcelona Cards before your arrival. Collection is not necessary. You are independent of opening times of the issuing points. Validity begins with the first use of the Card. Here you find the shipping times. The 2018 Barcelona Cards will be send from mid January 2018. Shipping by e-mail (free shipping): Immediately after booking you will get a voucher that allows you to pick up your booked Barcelona Cards directly at the tourist information at the airport or other locations in the city (issuing points are listed below). The voucher for the 2018 Barelona Cards will be sent by e-mail directly after your booking. It can be redeemed from 2 January 2018. All Tourist Info closed on 1st of January and 25th of December. Booking without risk: received by mail and unneeded Barcelona Cards you can return to us until the 15 January of the following year, we will refund the full purchase price. If you have booked the shipment via e-mail voucher, you can cancel the booking up to six weeks after the booking, but no later than 15 January of the following year. Enter the desired number of Barcelona Cards with group discount (10 persons at the minimum).